Today, it’s legal. Tomorrow, it might not be. By executive fiat, the Obama administration intends to eliminate one of the most common types of .223-caliber ammunition, used by the AR-15 and other general-purpose rifles. Why? Ostensibly because there’s a new type of handgun that is also capable of shooting the so-called “armor-piercing” or “green-tipped” rounds traditionally fired only by rifles. The Bureau of Alcohol, Tobacco, Firearms and Explosives announced on Feb. 14 a proposed ban on the manufacture, sale or importation of a popular form of ammunition used by thousands of law-abiding gun owners. Within hours of the announcement, the prices on the green-tipped .223-caliber rounds started skyrocketing. The rule change affects the Gun Control Act of 1968 as amended by Congress in 1986. Under pressure from the law-enforcement lobby, Congress in 1986 inserted language into the law designed to prevent so-called “cop killer” bullets from being used by pistol-toting criminals. The law was never intended in its original form to affect ammunition for rifles, as it was a given that rounds from any high-powered hunting rifle could penetrate the soft armor worn by officers. Jerry Henry, executive director of GeorgiaCarry.org, was equally outraged by the announcement. “This move is nothing less than this administration taking the law into their own hands, bypassing Congress and their constitutional duties of writing and passing legislation,” Henry told WND. As was the case with amnesty for illegal immigrants, Obama is using executive action to adopt a controversial agenda that lacks support in Congress or among the American people, Henry said. Henry said the “master-servant” relationship between American citizens and those who hold the reins of government power is slowly being reversed. The people, who used to be the master, are now becoming the servants of those in government. The National Rifle Association said in a statement the M855 ball should have never been classified as “armor piercing” to begin with. The original rule defined armor piercing as “a projectile or projectile core which may be used in a handgun and which is constructed entirely … from one or a combination of tungsten alloys, steel, iron, brass, bronze, beryllium copper, or depleted uranium.” Because there are now handguns capable of firing M855, it “may be used in a handgun.” It does not, however, have a core made of the metals listed in the law; rather, it has a traditional lead core with a steel tip, and therefore should never have been considered “armor piercing,” the NRA said. The decision continues the Obama administration’s use of his executive authority to impose its agenda and bypass Congress. It also illustrates the government’s expert use of incrementalism. First, the Congress and then-President Ronald Reagan banned “armor piercing” bullets in 1986, with certain exceptions. Then a later president comes back decades later and removes one of the most common exceptions. “If he gets by with this, I believe he will not stop in his efforts to disarm us via regulations,” Henry, of GeorgiaCarry, told WND. The NRA also noted the trend. Dan Cannon of GunsSaveLives.net said online prices for affected .223-caliber ammo started soaring within 48 hours of when the government’s proposed rule change was announced. That’s if you could even find an online vendor that had the rounds in stock at the new “low” price of 50 cents per round. “Online prices are up to around $0.50/round shipped, although very few vendors still have ammo in stock at that price. Other vendors are charging upward of $1.00/round shipped,” Cannon wrote in his blog Sunday. 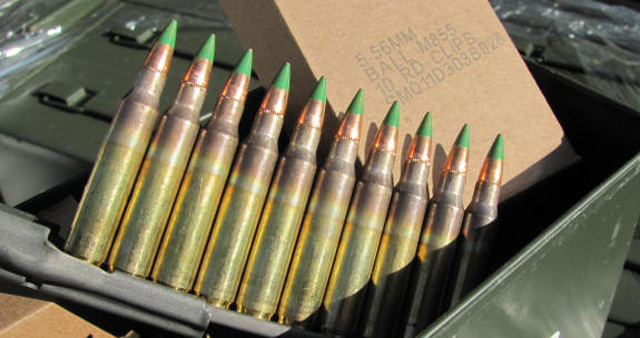 Before the rule was announced on Friday night, M855 could be found “fairly readily for about $0.34-38/round if you bought a full case,” Cannon said. Gottlieb said his guess is as good as anyone’s as to where Obama will strike next in his war against gun ownership. But he has proven one thing: He doesn’t need Congress. And ordinary American gun owners are beginning to take notice. Paul Glosser, a captain at the Marion, Ohio, Fire Department, posted on the Facebook site of Guns Magazine, that concerned gun owners should contact their members of Congress and ask them to “defund” the Bureau of Alcohol Tobacco and Firearms. This entry was posted in gun control, Guns, Patriot, Uncategorized and tagged .223, America, AR-15, armor piercing, Barack Obama, Communism, the second amendment, Tyranny on February 16, 2015 by Bone Fish.